Who doesn’t love a good girls’ day out? 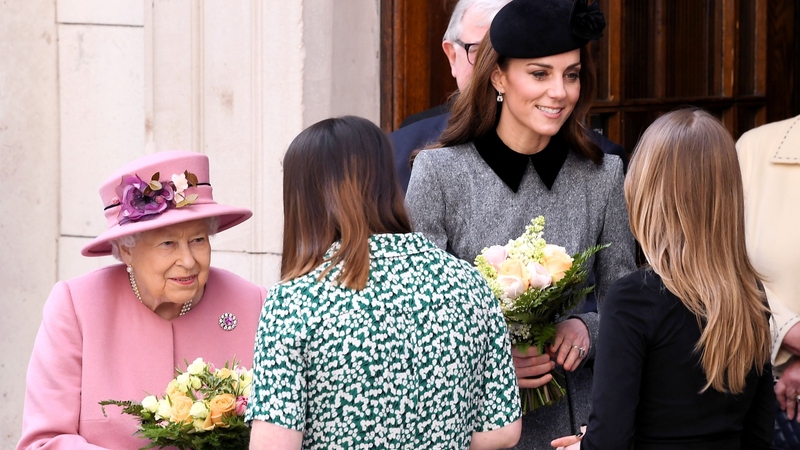 Catherine, Duchess of Cambridge, and Queen Elizabeth II enjoyed a joint outing on Tuesday and we are loving the photos we’ve seen of the special event. Per People, this female-only outing is significant since it marks Kate’s first solo public outing with her grandmother-in-law since becoming a member of the royal family in 2011. The two seemed to be in good spirits, even cozying up to share a blanket during their tour of King’s College’s high-tech Strand campus in central London. The queen, a patron of King’s College London, rocked a pale pink Stewart Parvin cashmere coat and her signature matching hat for the outing. The Duchess of Cambridge opted for a gray Catherine Walker coat and black Sylva Fletcher fascinator. In short, both women looked amazing — and seemed to be happy to be in each other’s company. Their rare day together as a pair entailed touring the campus’ educational facilities, observing students taking part in a “virtual trading floor,” and taking in the panoramic views from one of the roof terraces on the eighth floor. They even sat in on a robotics demonstration that included robotic surgery. According to People, Kate giggled as she shook the robot’s hand and said, “Very nice to meet you!” When it squeezed her hand back, Kate responded by laughing and marveling that it was “so strange.” The Queen reportedly looked far less enthused by the robot hand and chose to bypass a handshake. Before the women made their exit, university representatives gifted the royals with matching flower bouquets. And while we are totally living for this twinning moment, alas, it proved to be short-lived. Per Bustle, the queen headed home after the pair’s busy day. As for Kate, she’s scheduled for a solo visit to London’s Foundling Museum to observe progress being made toward helping young adults secure a foothold in art teaching. But, hey, here’s hoping that now Kate and Queen Elizabeth have made their first (adorable) official public outing as a duo, there will be plenty more like it to follow.